Attention all commuters and riders wanting to be seen on the roadways: our Hi-Viz Motorcycle Gear Guide has arrived. In this video gear guide, we feature six helmet options, seven jacket choices, and three vests to be worn over top of protective gear. 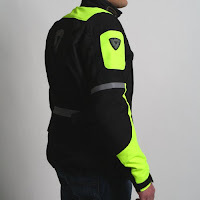 High-Visibility Motorcycle Gear continues to grow in popularity as riders become more conscious of the dangers of riding. Hi-Viz gear is a great choice for the commuter, the urban rider and the long-distance tourer. Check out our picks for the top tier of hi-vis gear. 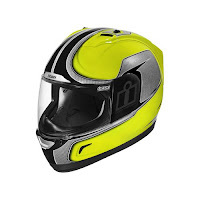 Hi-Viz Motorcycle helmets are available from many brands with that number growing as each wave of helmets comes is released. Our favorites come from Nolan, Arai, Icon and Scorpion. There are modular options, such as the Scorpion EXO-900 Transformer and the Nolan N43 Helmet, in addition to a dual sport choice in the Arai XD-3 helmet. Two touring choices, the standout Arai RX-Q and the Arai Vector, and one sport helmet designed for riding in the tucked position, the Icon Alliance Hi-Viz, rounds out our picks for the best hi-viz helmets. 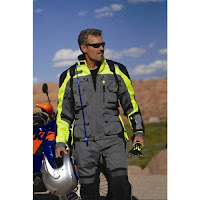 The best-selling full hi-viz Olympia Airglide 3 jacket is our first choice for hi-viz motorcycle jackets. The Airglide 3 is available in two high-visibility options, a full neon yellow construction and the "toxic" version which is hi-viz yellow with fire red accents. The outer shell is constructed from 500D Dupont Cordura with ballistic mesh panels to flow air in hot weather. The jacket also features a two-stage built-in liner jacket; the outer layer is waterproof and breathable while the inner layer is Thermolite insulated. 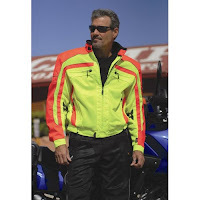 These windbreakers can be worn together or individually inside or without the outer shell providing a great deal of versatility and bang for the buck in this hi-viz choice. keep you warm, dry, and protected no matter what the conditions. The Olympia AST Jacket and Firstgear Kilimanjaro Jacket are also great options for four-season touring. They are both 3/4 length with waterproof breathable membranes built into the outer shells. For this reason, we see this as an excellent option for the rider in the Pacific Northwest where it stays cool most of the year and you see heavy precipitation. There are several large ventilation panels on both jackets and each has a removable thermal standalone liner jacket. With the vents open and the liner out you will get some good ventilation; it just won't flow as much air as gear with removable waterproof breathability. Olympia pioneered hi-viz motorcycle apparel and Firstgear isn't far behind as their R&D catches up. The Firstgear Rush Mesh jacket and the Dainese Shotgun jacket are going to be the ideal hot weather hi-viz options in this guide. The Rush Mesh has a full-sleeved water-resistant windblocking liner that can be removed when the mercury rises; couple this with the 250D polymesh outer shell and you will have plenty of airflow and visibility in extremely hot conditions. 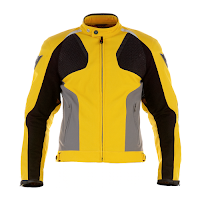 The Dainese Shotgun jacket is arguably the most stylish of the entire lineup with Dainese claiming that you will not find a more comfortable summer jacket on the market. With stretch fabric and tons of mesh paneling, including 3D mesh that creates air channels for added flow, you will absolutely be comfortable and cool wearing this in the summertime. high-visibility and built for all-season all-weather adventure riding. plastic back armor and reinforced rubber chest armor. 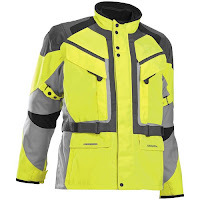 These are our picks for the best of the best in Hi-Viz Motorcycle Gear. There are helmets, jackets and vests to choose from for the maximum level of visibility and safety when you're on the road.